Smartphones have been around for quite some time now and one of the initial purposes that it was intended for was easy communication. As time eloped with traditional methods of communication, internet messaging came forward. Its not like people do not send messages via SMS but they prefer the convenience. Considering iOS as part of messaging, the platform has provided many ways of communication that includes SMS, iMessage and WhatsApp and any other that might make its way to the App Store. However, if its convenience we seek to send the message as fast as possible, whether it be WhatsApp, iMessage or an SMS there’s this awesome application that enables you to do so. In contrast to opening different applications and closing others and tapping every where to reach your desired destination to send the message, Written allows minimum hard work and more convenience to send your message. Lets get to the mechanics of the application. Written works by swiping down from any where of your screen and the app will be prompted. Next you have to make your way through the application to select your desired platform to send the message. This isn’t very hard, its right in front of the application and requires minimum time. 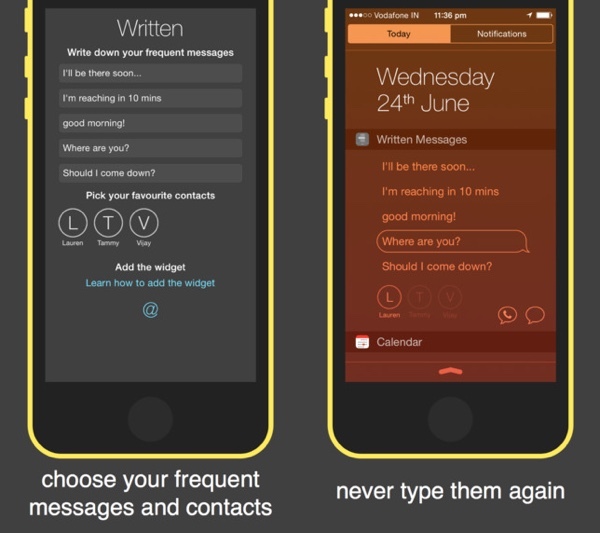 But before you straighten up to use the Written app, configure the messages and contacts that you frequently use. To configure the Written app, launch it and provide some pieces of pre-written text which will come in handy when you use it later. Next you will have to select some of your favorite contacts that you feel are the important ones. Currently. Written app supports WhatsApp, iMessage and SMS to be integrated in the application for later use. However, the working of the application is same throughout each platform. 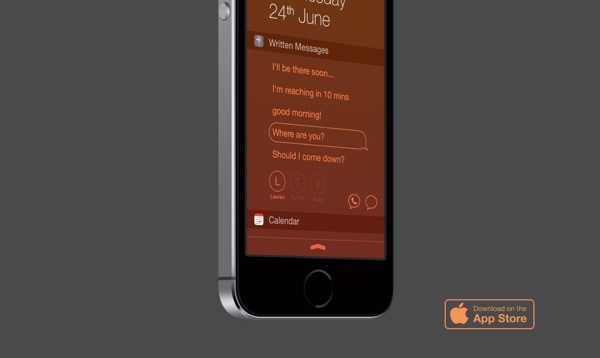 Set the Written Notification Center Widget and that is it. With this in your iPhone, you will no longer have to search for contacts to be selected and no need of looking for the icon to start messaging. Just swipe down and select your pre-set text and that’s it, as easy as it sounds. The Written App is available on the App Store for $0.99 and can be Downloaded from HERE. Do let us know what you think about Written.